You'll be £25.00 closer to your next £10.00 credit when you purchase Welsh at War. What's this? The Welsh at War trilogy is the culmination of over twelve years of painstaking research by the author into the Welsh men and infantry units who fought in the Great War. These units included the four regular regiments – the Royal Welsh Fusiliers, South Wales Borderers Welsh Regiment and Welsh Guards – as well as the Territorial Monmouthshire Regiment, the Yeomanry regiments: the Denbighshire Hussars, Pembroke Yeomanry, Montgomeryshire Yeomanry, Glamorgan Yeomanry and Welsh Horse Yeomanry and their amalgamation into service battalions for the regular regiments during 1917. Welsh troops fought with great courage in every theatre of the war – the Western Front, Aden, China, Gallipoli, Egypt, India, Italy, Salonika and in Palestine – and in addition to the casualties suffered during these campaigns, many men gained recognition for acts of gallantry. The three volumes, split chronologically, cover all of the major actions and incidents in which each of the Welsh infantry regiments took part, as well as stories of Welsh airmen, Welshmen shot at dawn, Welsh rugby players who fell, Welsh gallantry winners and the Welshmen who died in non-Welsh units, such as the Dominion forces and other units of the British armed forces. 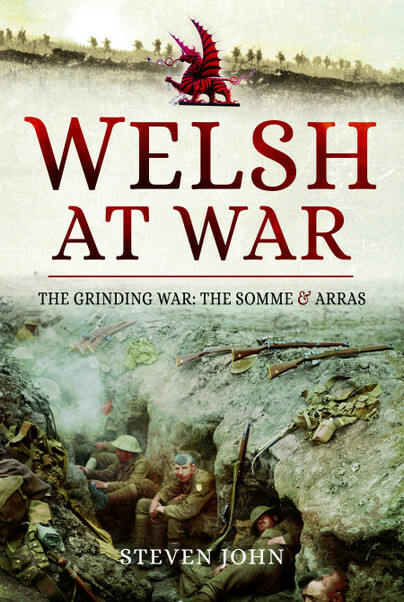 ‘The Grinding War – The Somme and Arras’ - records the gallant work of Welsh units and servicemen during the period between the arrival of the 38th (Welsh) Division in France during December 1915 until the aftermath of the Battle of Arras in the summer of 1917, covering: the campaigns in Mesopotamia, Salonika, Egypt and Palestine; the Battle of Jutland; the Somme offensive; the German Withdrawal to the Hindenburg Line; the Battle of Arras; the Battle of Messines Ridge; and the build up to the Third Battle of Ypres. These three books, a tribute to the Welsh contribution to the Great War, are the result of a ten year labour of love by the author Steven John. A fitting tribute to the part that Wales played during 1914-1918. The Welsh at War is highly recommended and especially for those with Welsh blood or connections. 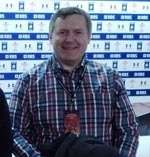 The culmination of over twelve years painstaking research into the Welsh men and infantry units who fought in the Great War, over 272,000 served among these the author’s great grandfather, Private David Thomas John 4th Battalion, Australian Imperial Force (4th AIF), while around 49,000 lost their lives. In the author’s own words he aims ‘to tell as many stories as possible that illustrate the heroic efforts of some of our Welsh forefathers during the epic conflict, to commemorate the actions fought by Welsh units and to highlight major battlefields soaked with Welsh blood and sweat.’ An outstanding trilogy and a must have for anyone with a special interest in Wales and the Welsh contribution during the First World War. It covers all of the major actions in all theatres of war where the Welsh took part and in all branches of the services. A suitable and lasting testament to their bravery.